A study conducted by the Ukrainian / Danish software firm Livatek suggests that there has been a shift in mentality in Ukraine over the recent years. 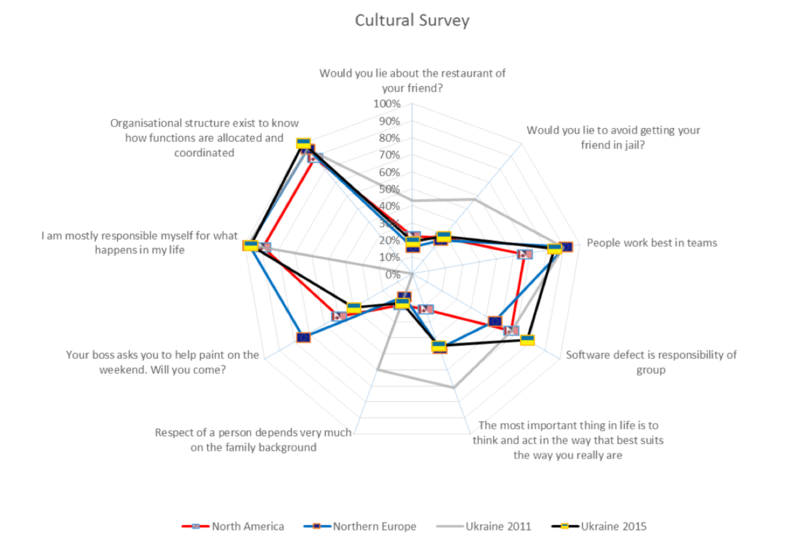 In a digital „cultural survey“ the participants were asked to respond to typical „questions of scruples“ regarding their professional and personal life. The study first has been conducted four years ago, which makes it even more interesting: Not only has Ukraine gone through dramatic times, and still is, but also there have been some dramatic shifts in the mentality applied to work and life in general. While the results for participants from Northern Europe and North America have been in the same range for both studies. The biggest finding is an interesting one: While in 2011 the mentality in the Ukraine was significantly different from the one in Northern Europe and North America, this difference is now gone for the most part. The Ukrainian mentality has adjusted to a more „western“ mindset. Fundamentally in 2011, there was no trust in the legal system. The individual and its direct friends were valued higher than the society. And there was a strong belief that your family background matters more than what you are doing – which direcly translates into who is supporting and protecting you is key to success. Now that has changed. The study concludes that the Ukraine is now a less individualistic society with much greater trust in law enforcement and the legal system. Its much less important for Ukrainians now who looks after you – much more important now is the belief that you can matter for yourself in life and achieve something by your own. This shift has happened in just four years – in which the Ukrainian society stood up against a kleptocratic tyrant and another one from its neighborhood, still facing the conflict. It makes me optimistic for the future of the country because these values we now share are the foundation for economic success. And economic success is key for stability of the society. The full study conducted by Livatek is available here. Time for Biometrics: Costa Rican Bank uses Facial Recognition for mobile ba... Do you speak Startup? This is the way to understand the special lingo.